Like most growers, Alan and Leslie Jones don’t like all the fingers pointed at farmers for problems the community faced. The natural impulse when activists and some elements of the media say you’re polluting the air and waters in your area is to point your finger right back at them. 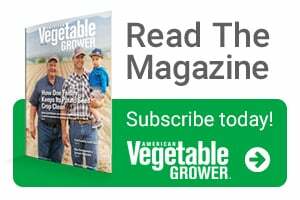 But the Joneses, owners of 2017 American Vegetable GrowerSM Grower Achievement Award-winning Jones Potato Farm, are taking a different approach. 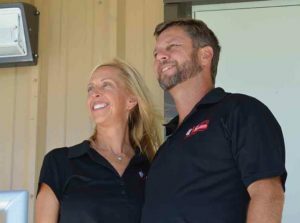 Although none of these anti-farm types have yet turned attention to their businesses, with its seven locations in Florida, the Joneses decided a knee-jerk rejection to these rants wasn’t for them. If you peel back to the core issues these activists are touting, it’s hard to disagree that being stewards of the land is a good thing. The real problem with activists is that they often don’t really understand farming. So the Joneses weighed how to answer these two questions: How could Jones Potato Farm be part of the solution when it comes to sustainable farming? And, how could it teach the public about farming? “It’s a proactive approach, a way for all of us to come together, feed our nation in a sustainable manner,” Alan says. The Joneses take each challenge they want to address, think through different ways they can approach them, then talk to others who they can work with on the solutions. “You have to come to the table with good ideas,” Alan says. 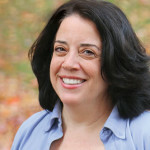 Leslie says her husband is especially talented in recruiting others in tackling common issues. These good ideas have led to a wide range of farming methods. “Alan Jones is a farmer that thinks out of the box and is doing all he can to improve his operation, improve his nutrient management, improve water conservation, improve the soil, and is a great example of being a great steward of the land,” says David Royal, Nutrient Stewardship Project Manager with The Nature Conservancy. Here are some of the ways that approach has boosted Jones Potato Farm beyond what one couple could do on their own. Managing water is a struggle for all Florida growers. The climate tends to swing from dry to hurricane, and high temperatures exaggerate the fallout from those swings. 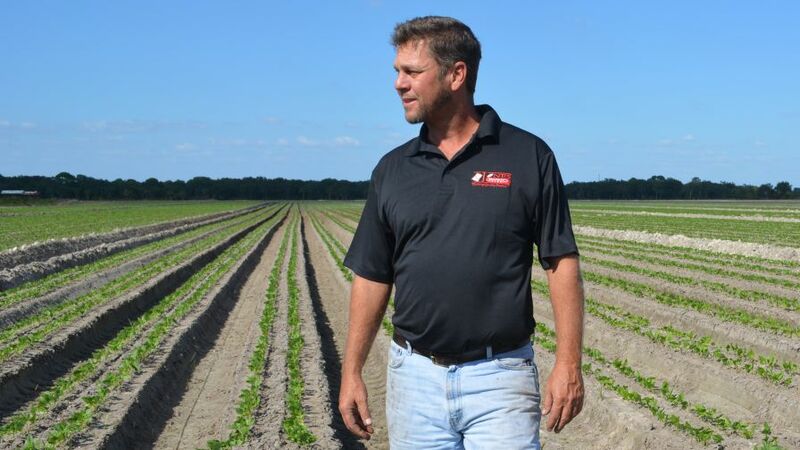 Like many Florida farms, Jones Potato Farm grows in sandy soil. It ranges from a dark sandy soil to a light, almost beach-like soil, which means there isn’t a lot of water retention. During big storms, the ground is saturated, but will dry out more than a grower would want. “The first thing you learn in Florida is how to get the water off the field. The second thing you learn is how to get the water back in the field,” Alan says. “We watch the Weather Channel a whole lot,” Leslie added. Sandy soil drains quickly, and in this case, it’s draining into environmentally sensitive wetlands, not to mention the Gulf of Mexico, which hosts major parts of Florida’s economy, thanks to tourism and marine-based foods like fish and shrimp. “You have to understand irrigation from a watershed perspective. Every farm stand stands on its own two feet,” Alan says. Here are some of the methods Jones Potato Farm uses to reduce its water use and to get more from the water it has. 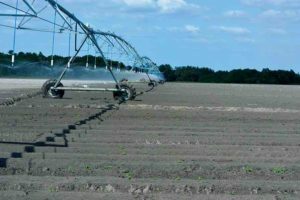 Low-volume center pivot irrigation saves more than one million gallons of water daily on Jones Potato Farm. Pivot irrigation. While pivot irrigation isn’t unusual in many parts of the country, it’s not at all common in Florida. “Around here, he’s the only one who has center pivots,” says Dennis Coleman, Crop Consultant with Crop Production Services (CPS). The first year the Joneses trialed pivot irrigation, the field saw a 70% water savings. Alan called his water district to let them know the results, which were far beyond what was predicted. “They came to the farm and they saw how we were using it,” Alan says. The couple now have an additional 15 pivots, which saves the farm 1 million gallons a day during the season. Although the pivots aren’t in all fields, the operation still saw a whopping 57% water savings over its historical use. Alan has made some modifications to his pivot-irrigated fields, adding seepage irrigation where needed. Other growers in the area are learning from Jones’ results, Coleman says. Laser leveling. When drainage really matters, it’s important to have control over how fields drain. Laser leveling gives fields at Jones Potato Farm a positive drainage. 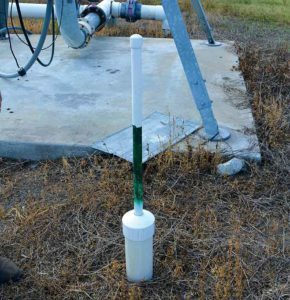 Float wells provide important information on soil moisture. Jones paints the neck of his float wells to indicate optimum surficial water table levels. Water capturing. The most recent improvement the Joneses are adding to their operation are two water recovery reservoirs. They’re being built to filter water through natural attenuation, so the operation can reuse the water for the center pivot system. “If we get into a drought situation, you still have your wells to supplement our irrigation,” Alan says. One reservoir is set up for vegetable production, the other is situated in the citrus groves. At some of the Jones locations, brackish water in wells can be an issue. These ponds allow them to bypass the wells more often. Cost share programs have made building the reservoirs financially viable. A common issue for growers in climates warm enough to grow in winter is day length. Most growers in the U.S. have long summer days. The short days during the Florida growing season put pressure for near-perfect performance on other basic areas like soil health. Just as the Joneses approach water management on multiple fronts, the couple and their team do the same with soil health. In this goal, they get a lot of help from Coleman, the CPS crop consultant. “Soil building is a long-term effort. Dennis and I think along the same lines,” Alan says. The respect is clearly mutual. The amount of data revealed by soil tests can be overwhelming. But Alan Jones and crop consultant Dennis Coleman created a color code for their results, making them easy to read and act upon. Results shown here (top to bottom): pH scale; CEC; Lime Recommendation. One area Alan wanted to understand better is the micronutrients in his fields. 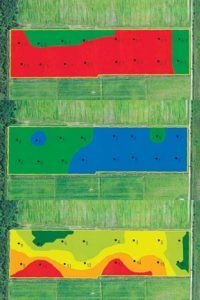 Coleman suggested mapping fields in a grid to give a more detailed view of what’s happening, soil-wise. It was a great idea, but there was one problem. “We have five times as many soil samples today,” Alan says. He needed to get a grasp on how to process all this new data into a form that he and his team can use. So Alan and Coleman traveled to Stillwater, OK, to visit an agricultural data company. “They basically helped us put together a program to take all this soil data and color code it by the parameters we wanted,” Alan says. The color coding makes it easy to understand what’s needed, he says. Not only for him, but for everyone on his team. They can do a soil test, and get the results broken down onto an iPad, giving them clear instructions on which inputs need to be added or cut back on. By making the complicated data results so accessible, the operation is able to use variable rates in an affordable manner. Jones Potato Farm is including bionutrients and organic materials within its fertilizer program. To Alan, it’s a simple approach: “The right tool at the right place at the right time,” he says. All the various innovations Jones Potato Farm employs originate with the Joneses willingness to face their problems, brainstorm solutions with their team, then recruit others to develop and implement their ideas. It’s a flexible mind set that can be hard for many to adopt. It can feel like too much is at risk to take chances. “You’ve got to be careful about getting too entrenched in a plan,” Alan says. But with the input of local and state organizations, water boards, Extension programs, crop consultants, and fellow growers, just about any problem can be conquered. One problem the industry faces is that the public tends to think any farm over a few acres is an environmental problem. Alan and Leslie Jones are working hard to change that. They welcome all types of groups to their farm, from master gardeners to chef tours to school programs. And they’re big fans of the Farm to School program. “It’s just a fabulous way to talk to Alan and get a handle on what we’re doing,” Leslie says. Jones Potato Farm works with Farmers Feeding Florida, as well as having a standing order with local food banks, who come to the farm every Thursday during the harvest season to pick up truckloads of produce. Another way it serves its community is driving what Leslie calls a “farmers market within a truck” to communities situated in food deserts, where fresh produce is hard to come by. Alan speaks at many community events, explaining how growers are pursuing sustainability for the environment, for the economy, and general business health. “There’s bad apples in every industry. We’re just trying to do our part. I talk about what I can do, what we all can do as business owners,” he says. The man had heard him speak at a local event, and was struck by how innovation can lead to great advances. Little by little, the Joneses are winning public confidence in farming.